Last night I was very late to join in. I went to the club to celebrate birthdays and well wended up staying until very late. The Karaoke competition kept me entertained. When I got home I was still pumped so I got my new project out and stitched around the letter E.
Now to work on all the other 7 letters. I thought they were lips but on second looks, maybe not? Mysteries abound in blog land at the moment. looking forward to seeing the finished project when it's done :) Barb. That aqua thread is working well with that fabric, Simone. I wonder what the word is! Looks good in that cute fabric. Hope you got some sleep. 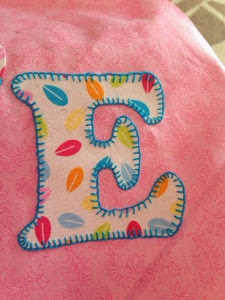 Great to see you got some stitching done, I wonder what comes after E.